Couponing Update: Happy National Couponing Month! 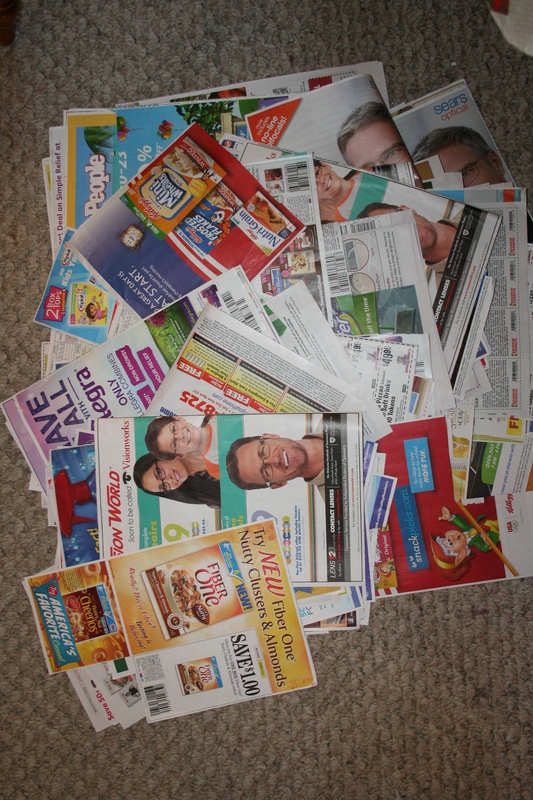 I had dozens of coupons booklets to go through this past week, coupons that had accumulated throughout the summer months. I spent my summer not couponing, living off my coupon purchases that I’d stockpiled from January to June. I absolutely loved having everything here, not having to make any purchases of those stockpiled items all summer. There are some items I still don’t need to buy yet. But, it’s time to get back on the money-saving wagon. I was thrilled with how my stockpiling plan worked out and I plan to do the same thing for next summer too. In the meantime, I will continue to live off of the things that are left before buying more of them. There were also things I ran out of, like body wash for example, that I’d be more conscious of buying more of next time. Five new beach chairs this summer…purchased with a combination of coupons and CVS Extra Bucks! I also wanted to pass along a few different couponing tips for you, it being National Couponing Month and all. First, remember that coupons are not just for food and grocery items. For example, see my five new beach chairs in this photo? 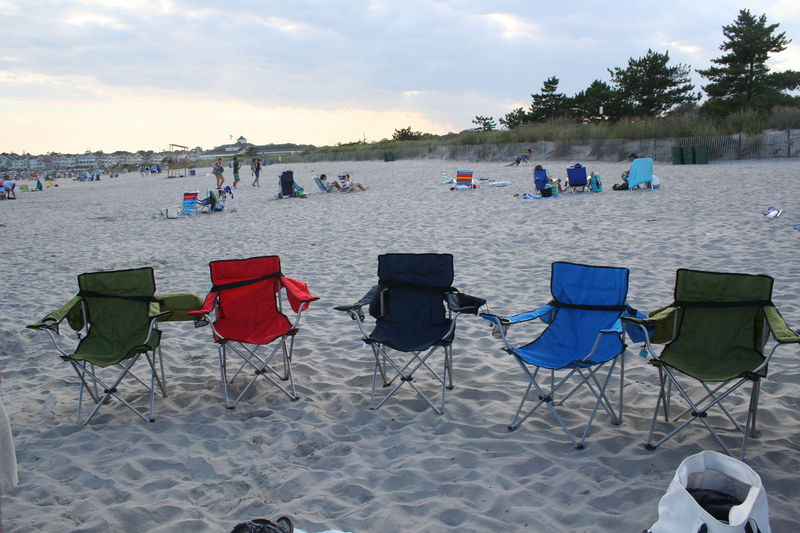 Here’s the story behind them: we desperately needed new beach chairs this summer. We hemmed and hawed about spending upwards of $10 per chair for five new chairs, and we had seen some on sale for $8.99 that we were considering buying. However, one Wednesday morning I went to CVS to buy my newspaper and lo and behold, they had a box of beach chairs right by the register on sale for $5 each, which was great. They’d cost us $25. But, it doesn’t end there. I swiped my card at the machine and out popped a coupon for $5 off a $20 purchase. I couldn’t believe it. Even better, I had $3 in Extra Bucks to add to my deal. So in the end, I got five chairs for $17. Much better than the $45 (plus tax) I’d been prepared to spend. See the skirt? Two coupons made it completely free this past August. Every time I wear it, I think to myself, “This skirt was completely free.” Every time. Here’s another great couponing example: My skirt in the photo to the left. It’s my new favorite skirt, you know why? Because it was free. Completely free. I walked out of the store with one skirt and never even opened my wallet. And no, I didn’t steal it. Bob’s Store near us sends out a $10 coupon each year for your birthday if you’re in their rewards program, which I am. At the same time that I had my birthday coupon, they also sent out a 25% off coupon in their flier. I put the two together, headed for the clearance rack and saw this cute little skirt in my size for $12. I had so many emails for free restaurant items for my birthday–appetizers, desserts, ice cream, etc., that I couldn’t even use them all. But, if I had, they would’ve all been free. I have one last couponing tip for you before I end this post. 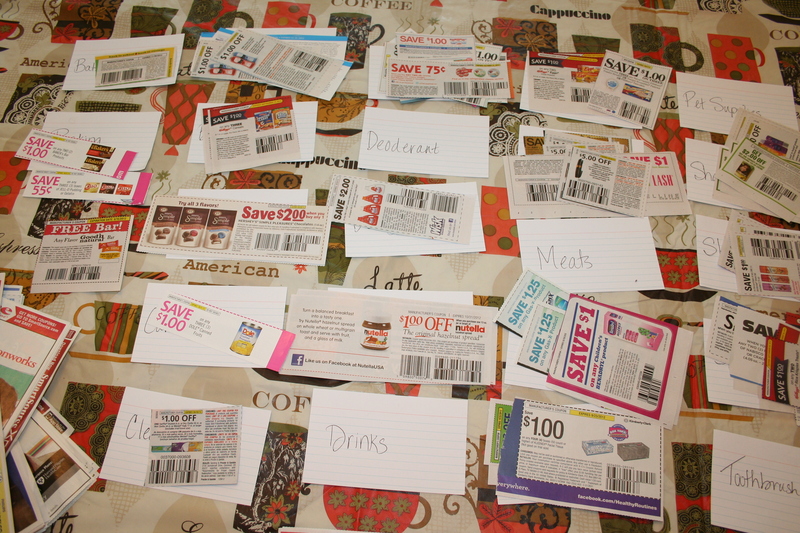 My super-easy way of sorting my coupons quickly as I cut them. Several people have asked about the organizational part of couponing. 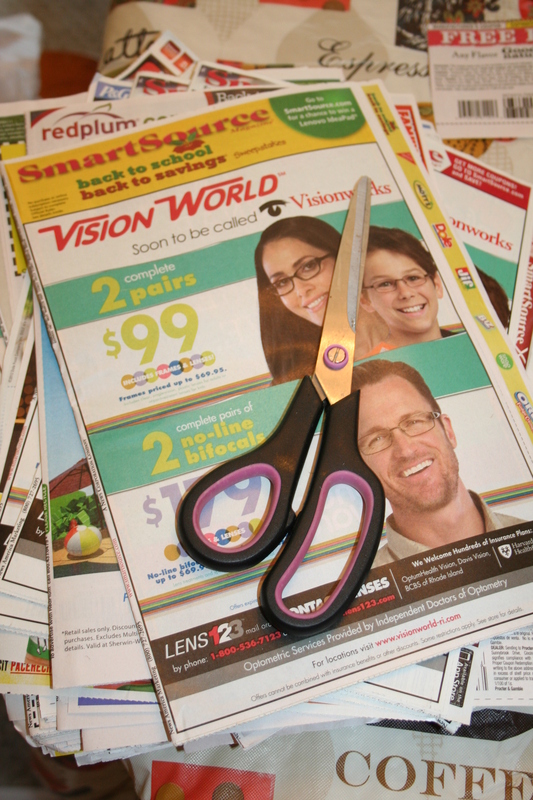 I thought I’d share what it looks like when I’m cutting my coupons because of course, I have a system. After I’d labeled the tabs in my coupon holders alphabetically with my categories, I took a stack of index cards and put those same categories on the cards and put them in the same alphabetical order. Each time I cut my coupons I take out the cards and lay them on the table in front of me. As I cut each coupon, I place it on top of the card of the correct category. This way, as I’m cutting, I am also sorting at the same time. Previously, before I thought of this system, I’d just cut and make a big pile of coupons and then one coupon at a time, I’d place them into my coupon holders. It took forever and I dreaded doing it. It didn’t take me long to figure out this simple system and it works well for me. Everyone has their own way of organizing their coupons so it may not work as well for you, but I’m passing it along anyway, in case it helps you. Now that school is in session, I’m able to start keeping an eye out for sales and coupons on those items I’ve run out of so that I can start shopping and stockpiling again. I can’t wait! If I get any other great deals throughout the year, I’ll continue to keep you updated. This photo goes with the one at the top of the page. The one at the top was my Still To Cut photo (hence the scissors) and this one was the Already Cut pile on the floor next to me. I was about halfway through. That shows you how many coupons I’d piled up over the summer. It only took me two hours to do what I had not done all summer, and I could quickly scan for expiration dates and items I was out of.